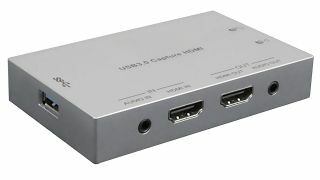 The What: TEKVOX has released its 79060 HDMI to USB capture device. The 79060 features full 1080p60 resolution on its HDMI input and output, and can both insert and extract audio from external sources. This versatility allows it to take in HD video and audio from a mixer while recording to a connected PC, displaying video on a confidence monitor, and feeding an extracted audio signal to a speaker system. Implementation of a low-cost HDMI to USB recording system is often complicated by the addition of splitters, audio embedders, de-embedders and scalers. The 79060 avoids this problem by fully integrating all necessary functions into a single, compact unit. The Bottom Line: Retailing at $249, the 79060 is engineered as a cost-effective solution available for those who want versatile, reliable, and compact video recording via a single USB connection.